Or, was. Obviously, I'm not sleeping as I type this. Have you met my Muses yet? Yes, you have met one of them but not the other. Let me officially introduce them both to you now. But, sh, because, as you know, they are sleeping. 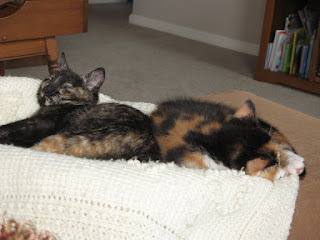 Meet Calliope and Clio - my Muses. 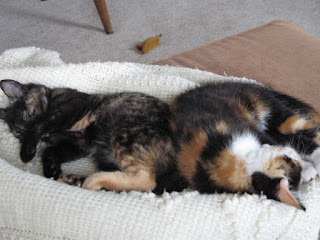 Clio is on the left. She's been with me since last Thursday. As you can see, she and Calliope are now best buds. It didn't take long at all. Calliope came a few weeks ago and she thinks Clio is her toy. Calliope was the Muse of Epic and Lyric Poetry. She was the eldest and wisest of the 9 Muses. She was the most excellent Muse of all, accompanying respectable royalties on their way. Calliope was the favorite Muse of the Greek poet Homer; many even consider Calliope being the actual mother of Homer. Another child of Calliope was said to have been Orpheus, a famous musician and poet in ancient Greece. In depictions Calliope can be seen crowned with gold, holding a writing tablet or a volume of Homer's Odyssey in her hand. Clio was the goddess of epic poetry and history and is also considered to be the inventor of the guitar.Clio once fell madly in love with the King of Macedonia, Pierus and with Pierus she created the beautiful Hyacinth, the lover of Greek god Apollo. Clio is often depicted dressed in purple with laurels on her hair, in the one hand holding a cornet and in the other a book, the book Cleio used to write history. I didn't plan for my muses to come live with me. They each sort of fell into my life. Calliope first, and her name rolled off my tongue one day and Calliope it was. Clio came next, and I wasn't looking, but now she's here and I can't imagine it any other way. When I polled a couple of friends about names for her, my friend Nancy immediately emailed me the list of names of Muses. And Clio it was. And as I said at the beginning of this post, right now they are sleeping. In fact, they have slept most of this rainy and lazy Monday afternoon and evening away. I admit, I napped along with them. Perhaps the writing will come tomorrow. Awww, how cute. Looks like the baby settled in fine. 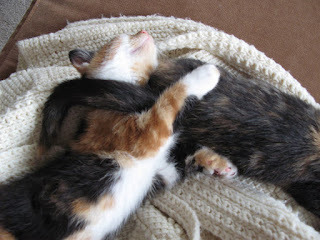 Mom told me yesterday she's getting two little calico kittens from my uncle. Lots of calicos right now. It's the kitten time of the year, I guess. Good for you Mom, Jennifer! Calliope is a beautiful Calico--I always wanted a Calico! 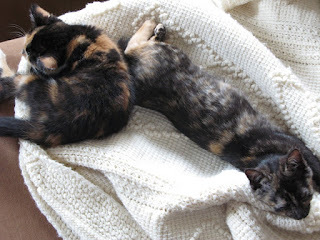 -- and Clio is a Torti, or tortoiseshell kitty. Jan had to tell me what a Torti was, and then my friend Google filled in the blanks. I love that their coloring is the same and that they are close to the same age. Clio is about two weeks older. So, Jennifer, do you still have the chick problem? Maddie, I'm so glad Calliope and Clio have each other, and that both of them have YOU! I'm free! Well, sorta... I'm on vacation! It's Kentucky, it's the Derby, it's a hat!